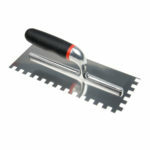 Steel tiling trowel with a 'U' shaped notch size that is 20mm wide. Made from standard stainless steel with a wooden open handle design. 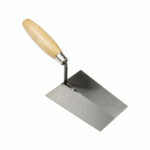 This U notched steel tiling trowel has a ‘U’ shaped notch size that is 20mm wide. 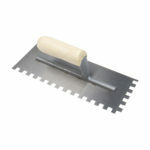 ‘U’ notches offer increased smoothing and levelling qualities for tiling on uneven floors. 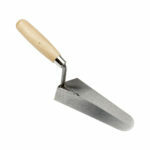 Made from high carbon steel – ground polished, hardened and tempered for strength and durability. with a wooden open handle design.